Explorer Adventure offers Bhutan Cultural Tour, an interesting journey of little more than week duration where you can witness the hidden culture and age-old traditions life of Bhutanese people as it were hundreds of centuries. 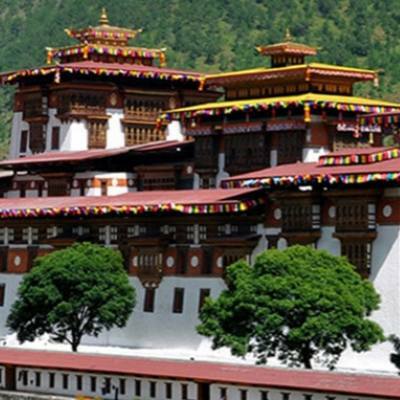 Bhutan Cultural Tour will let you immerse into its colorful impressive custom and old heritage where tour leads you to monastery and stupa of great interest including markets and rural villages with active farm life which certainly fascinates you on this wonderful trip for over a week time. Starting with arrival in Kathmandu and then with sightseeing tour at places of interest as Kathmandu is teemed with world heritage sites which makes this trip even more impressive and interesting, after a pleasant stay in Kathmandu our next journey takes you to Himalayan Kingdom at Bhutan. Taking less than an hour scenic flight to land at Paro in Bhutan international airport, where an exciting drive takes you to the capital city of Bhutan at Thimphu for enjoyable walks and sightseeing tours and then towards Punakhacrossing over highDochu-La at 3,200 m pass to reach a warm valley of Punakha where you observe the rural village farm life. Then our tour leads you back at Paro for fabulous walk to Taksing Monastery Tiger Nest with grand views of Bhutan landscapes and peaks before flying back to Kathmandu or to your next port of call after a marvelous Bhutan Cultural Tour. 1 Day 1: Arrival in Kathmandu and transfer to hotels.On reaching Kathmandu Tribhuwan International Airport where you will be warmly received by our guide and staff and then transfer you to your respective hotels in the hub of Kathmandu city. First check into your hotel rooms on getting refreshed from the flight and with Jet-Lag, then join with other members of Bhutan Cultural Tour for group briefing, where our expert guides will inform regarding your stay in Nepal, hotels, trekking, local lodge and overland drives with do’s and don’ts information, evening welcome group dinner in authentic Nepalese restaurants with Folk cultural programs to entertain you during your meals. 2 Day 2: In Kathmandu with sightseeing tour around world heritage sites.Morning after breakfast leave the hotel for exciting guided sightseeing around Kathmandu where our city guide will lead you to places of interest, Kathmandu a metropolitan city still retains its ancient heritage and varied ancient culture where you will visit world heritage sites around Kathmandu for half day or full day. After an interesting and wonderful tour of ancient historical and religious sites around Kathmandu, with afternoon free preparation for next day journey to Bhutan Cultural Tour. 3 Day 3: Fly to Paro 2,280 m and drive to Thimphu 2,300 m - 02 hrs journey.Morning transfer to Kathmandu international airport for scenic flight to Paro in Bhutan, less than an hour flight to reach at Bhutan international airport in Paro, after going through visa formalities our native guide of Bhutan and representative will receives you and then drive for few hours to Thimphu, the capital of Bhutan. On drive with views of countryside dotted with farm villages and terraces with typical Bhutanese landscapes and Buddhist culture architecture villages. On reaching Thimphu check into nice heritage style hotels, afternoon at leisure with time for a walk around the market and observe the Bhutanese way of life. 4 Day 4: At Thimphu with exciting cultural and historical tour.After refreshing breakfast our guide will take you on a tour of memorial stupa, indigenous hospital, where traditional medicine is still practiced and the painting school. Tour of Memorial Chorten (temple) built in memory of the late 3rd King of Bhutan. 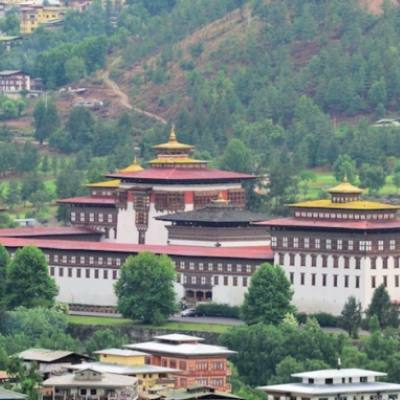 Visit of ChangangkhaLhakhang, the oldest temple in the valley offering a nice view of the valley, a short scenic drive for a visit of the largest and recently built statue of Buddha with wonderful view of entire Thimphu valley. After an interesting tour around Thimphu return back to hotel, after lunch tour around traditional Hand Made Paper Mill, School of Arts and Crafts where students learn 13 different arts used predominantly in Bhutan, Folk Heritage Museum, National Library and the Traditional Institute of Medicine. Drive to the Zilukha nunnery to meet the nuns and interact with them. 5 Day 5: Drive to Punakha 1,350 m- 03 hrs driving journey.After a great time in Thimphu, morning scenic drive to Punakhafor few hours as ride leads overDochu-la pass at 3,200 m, in fine clear weather a fantastic view of Bhutan’s highest mountains Chomolhari / Jumolhari can be seen with other snowcapped peaks extending almost 180 degrees. Walk around108 stupa and continue drive to sub- tropical valley of Punakha, on arrival, if time permits hike to the temple of ChimiLakhang, the temple of fertility associated with religious art of phallus. 6 Day 6: At Punakha with interesting tour and drive to Paro.At Punkakha a short hike for less than 2 hours to TashigangHongtso Monastery, located into a clearing at the edge of a serene forested area overlooking the town of Hongtso, Tashigang has been one of our favorite visits for well over a decade. In the surrounding buildings are pilgrims practicing silent meditation, and a peaceful calm pervades the area. The monastery houses about 40 orphans, who receive language, religious and general education from the monks an interesting tour of the Gompa (monastery), observe a private ceremony with chanting using ceremonial instruments in the main temple room, here you can interact with head lama. A nice drive at the top of Dochu-la for superb views of Himalaya peaks, including the unclimbed peak GangkharPuensum, 7570 m (24,836 feet). Then back to Punakha Valley for the drive to Paro with superb scenery of Bhutan countryside and villages. On reaching Paro transfer into a nice hotel for overnight with rest of the afternoon at leisure for short walks around the market. 7 Day 7: Sightseeing around Paro at places of interestMorning after breakfast, our expert guide will take you on a pleasant walk or short drive with an hour uphill hike to Bhutan’s famous landmark old Taksang Monastery known as Tiger's Nest. A place for retreats and meditation of many Buddhist monks and high priest of Bhutan, the monastery located within the overhanging rock cliff with superb views of Paro town and snowcapped peaks towards north, from here with steep downhill a short drive to visit 17thcentury Ta-Dzong, later converted into the National Museum in 1967, afternoon free at leisure for stroll around Paro shops and markets. 8 Day 8: Fly to Kathmandu and then transfer to your hotels.Morning transfer to Paro airport for the flight to Kathmandu or to your next respective destination with connecting flight from Delhi-India or back to Kathmandu, during air scenic views of mountains, green scenery of hills and farm fields within nice villages and towns as flight lands back at Kathmandu and then drive within hustle and bustle city life of Kathmandu. On reaching your hotel with time for individual activities and shopping souvenirs. 9 Day 9: Depart for international flight home ward bound or to respective countries.Your last memorable day in Nepal after a wonderful experience on Bhutan Cultural Tour with great service of Explorer Adventure, and as per your international flight then transfer to Kathmandu international airport for homeward bound or to your respective destinations. People and Culture: Mostly Bhutanese people off Buddhist religion, culture with age-old custom. Tour Hours: From minimum 4 to maximum 5 hrs. Season: Nearly all months of the year except July and August the monsoon wet period, March to May wild flowers in bloom with clear morning might get cloudy late afternoon times, October to November clear day for viewsbut can becold in the morning and night time.